If you can make sense of the Brexit press you are a better man (metaphorically speaking) than I am. The rumors over the last week were hopeful but bizarrely non-convergent, with verbal mini-bouquets from Donald Tusk and Jean-Claude Junkcer matched by cheery rumors from unnamed sources who supposedly knew what was up on the UK side. The EU was supposedly making concessions. Wellie, those concessions might simply mean the EU would let the UK have a pretty-close-to-content-free “future relationship” section. Theresa May was very secretly working on Chequers II. And the DUP’s Arlene Foster was wobbling just a little bit. That was two days ago. Bloomberg reported, with no specifics, that the UK indicated a breakthrough was not nigh. Then the Sun said May was digging in her heels and demanding the EU make major concessions and give “a precise Brexit framework.” And she insisted the EU “accept a UK wide customs solution as a backstop to keep the Irish border open” and said she won’t propose anything else. Today, the Financial Times, consistent with earlier reports, said that as many as 30 Labour MPs might join the Tories to back May’s Brexit agreement….assuming she gets one. This story is silent on whether the Tories are whipping Labour members or wether the Labour MPs have concluded on their own that they don’t want to vote for a no deal outcome. If they are being solicited by No. 10, that would suggest that May is not on to Chequers II, since it would be exceptionally bad form to give Labour members an information lead over Tories, and you’d expect to see some leaks about what Chequers II might be if May were trying to get backing for it. It had been widely expected that the commission would adopt its version of that blueprint, known as the Joint Political Declaration, on Wednesday…. A number of high-ranking sources in Brussels have, however, played down the optimism that was expressed over the weekend that a deal was imminent. Oh and Arlene Foster had a thing or two more to say about the Irish border matter, and the DUP’s old red lines are very much in place. If nothing else, this is the second time Theresa May has won on process. Recall that the EU tried to set the order and timing of negotiations with an April 2017 EU directive. The UK did not attempt to negotiate that in advance, and it squealed at some of its requirements, most important, on settling the so-called exit bill as one of the first orders of business. But the EU designated the Irish border question as one of the first three items to resolve, and let that slip to December 2017, only to let it slip again with the Joint Agreement. Admittedly, May lost with her ploy to try to win EU leaders over to her point of view with a personal appeal in Salzburg last month. But even though the EU told her firmly, “No Chequers” and “come back with a new plan by October 18 or no November talks,” May has successfully stared down the EU on changing the order of battle. That might not be entirely her doing. I’m not clear on EU protocol, but Tusk (and Juncker) may not have had authority to make this change on their own, and some countries that are nervous about a crash-out Brexit might have pressed them to relent. The big idea at the heart of the U.K.’s backstop proposal for avoiding a hard border between Northern Ireland and the Republic of Ireland (the key to a Brexit deal) is the “bridge.” This is the term senior officials use for the Temporary Customs Arrangement (or TCA) proposed by the U.K. in June. Let me stop here and scream because even if the EU weren’t opposed, this scheme wouldn’t accomplish the UK’s aims. A customs union does not confer “frictionless trade”. All it does is stop tariffs from needing to be collected. It does nothing to assure consistent regulatory standards and enforcement, as so would not prevent all sorts of non-tariff trade barriers from coming into play. Opposed: The EU, Brexiteer MPs…. The Bank of England and the financial services industry on Tuesday pressed the EU to urgently tackle legal uncertainty surrounding vast amounts of derivatives because of Brexit. Calling for “timely action” by EU authorities, the BoE’s Financial Policy Committee said if the UK crashed out of the bloc without a withdrawal agreement it risked rendering void £41tn of derivatives. 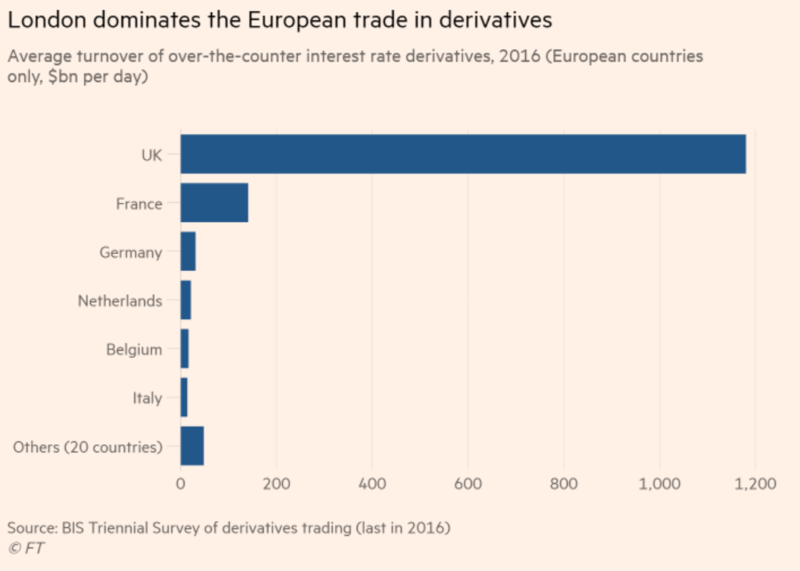 For EU banks to transfer derivatives business from the City to clearing houses in the bloc would involve closing out of thousands of contracts and opening new ones elsewhere. That would result in the banks having to lodge millions of dollars in extra margin payments with EU clearing houses to cover their derivatives positions, as well as setting aside more risk capital. There are also significant practical impediments to EU banks moving derivatives business because their vast portfolios of contracts are complex. For some kinds of swaps, there are few alternative clearing houses in the EU to those in London. For other derivatives, there are no other options. In an effort to prod the commission into action, the BoE suggested the EU has got more to lose than the UK over this issue. It flagged how the European Central Bank estimates 90 per cent of interest-rate swaps coming from the EU are cleared through London. But for LCH, derivatives business secured from EU banks is just 14 per cent of the global total. So is this a very high cost, high risk way to force more business to the Continent? Or is there a big piece we are missing, like most of the derivatives are short term, and so conceivably could be rolled over at maturity (still risky due to basis risk, but perhaps not as bad as trying to book new position that replicate current ones (as in having not just extra margin needs but potentially double exposures due to not being able to match close-out/new booking times very precisely?) Or are overwhelming majority of derivatives placed by trading desks and hedge funds, as opposed to commercial customers, and the EU isn’t charitably disposed towards them? In any event, the looming Brexit car crash continues to be interesting, and not necessarily in a good way. It’s not just you, Yves. I can’t really make sense of what’s going on at the moment either. Here’s my attempt to explain what’s happening at the moment. Let’s go back to first principles, which is often useful to do when everything else is fluid and highly unclear. What does each party want from the Brexit negotiations? For the UK, this is easy: it wants to retain all of the advantages of EU membership, while suffering under none of the restrictions, and free to do what it wants. It’s not going to get this of course. But in wanting the richest of cakes, it at least has clarity. But what does the EU want? This is what is actually not so clear, because there are a number of contradictory factors that drive it. It would like to avoid a hard or no deal Brexit, because there would be economic costs for the EU, in particular for countries like Ireland and the Netherlands whose economies are more closely linked to the UK. It would also be considering the risk that there may be unpredictable and severe follow-on effects from a hard Brexit. It doesn’t want to cut any of its members loose – in particular Ireland, so it genuinely wants to respect the Good Friday Agreement. But it also doesn’t want to give a deal to the UK which is better than membership (or even roughly equivalent) – because that could then encourage other members to leave, and strike out on their own. Eventually, this could threaten the EU itself, and the prosperity and peace it’s brought to Europe. These factors are to a degree contradictory. The EU can offer a softer Brexit now, but at the risk of its long term integrity. Or it can look to the future and not budge, but pay a real, and possibly significant price in the short term. And that’s why we have a problem: The EU, contrary to the cretinous statements of David Davis, actually does hold all the cards, but it can’t decide how to play them. The French are obviously agitating for a more punitive Brexit, the Germans seem to be keeping silent, and there are other countries (Italy, Hungary) who would prefer to give a gentle Brexit to the UK in the hopes of closer future cooperation. In essence, they are trying to decide how much cake they’re willing to give the UK in order to avoid a costly no deal. I think this will come to a head soon enough, probably at the Council meeting in October. There, they will have to thrash out what their final offer will be, and present it to the UK, pretty much on a take it or leave it basis, although it will never be publicly spoken about in such terms. Then the usual programming of the Westminster circus of derangement will resume. And in the meantime, I think all parties are hoping for events which could break the stalemate. Just so long as they’re not black swans. Thanks for working this through but I beg to differ on your key assumptions. 1. The UK isn’t unified. May has managed to keep herself in place despite the Tories being deeply split between a hard and a softer Brexit faction. I am increasingly of the suspicion that the Ultras never wanted to have the PM position, they just wanted to keep threatening May to keep her in line…..which they haven’t really. Even barmy Chequers is softer than they want. Labour is also divided. 2. The EU isn’t worried about the UK doing well after a crash out. They are worried that even though the UK will definitely suffer more, they could take enough damage to hurt all sorts of important political players. And now I feel like an idiot. I had assumed Barnier was being as accommodating as he possibly could be given the givens so as to reduce the UK’s ability to blame the EU if there is a crash out. But in fact the Government and the UK press will blame the EU no matter how badly the UK behaves. So Barnier is instead building a record that this really was completely the UK’s fault if there is no deal for the benefit of EU national leaders. 3. Germany hasn’t been silent. Merkel backed the Macron/Tusk position at Salzburg. German automakers lined up solidly behind Merkel early on, and more generally, behind the principle of the importance of preserving the EU. This was reaffirmed as recently as last month (due to the hour I am not digging out the FT article), when two leaders of major German organizations, one for automakers, the other some sort of industrial group, said they were worried about a no-deal Brexit and urged the UK to be more flexible. Even Denmark which exports a lot to the UK, has been following the major country position. The Parliament isnt unified, but honestly, when has it been in recent memory? The Ultras might have wanted the PM position, but after the whole referendum and increasing animosity of the people on either side of the isle, I think they opted to wait and see. I dont know if they intended to keep May toeing the line. May always seemed to have one foot in the exit and one foot in the remain. In fact, it could be said that she herself probably wanted to remain in the EU. May herself never actually told any reporter or interviewer her true stance on the issue, which to me is an indication that she was for remain. When asked after her Mansion house speech, she just said the standard ‘this is what the people wanted’ line that she has stated many times after. Therefore, when things began to go sour, it was unclear if they went sour because of May or because of EU interference. Boris indicated that at least part of the blame was on May herself. What this says to me is that May never intended to have smooth negotiations, and frankly, because the whole issue & papers have been kept in such secrecy, it augurs dark times for Brexit. 1. May wanted to be, and remain as long as possible, the Prime Minister. 2. Boris wants to be Prime Minister so much, that he’s probably sold his soul to the Devil 10 times over. He could be accused by May of the faults of Cassius, without “lean.” Boris’ naked ambition is as grotesque. 3. The EU’s opening requirement was for a large, or huge, pile of money. As a condition for starting negotiations, a non starter for any negotiated result. 4. The Tories will do everything they can to put the blame on Labor. If there is a Labor Government in the next 20 years after after Brexit, the Tories will blame Labor. AKA: It was ok on my watch. 5. The UK does not spire to be a Autarky – an Autarchy yes. The UK will continue as the tax haven for the world, which given the current imbalance of the world’s wealth, is both a profitable and probable objective. If the UK working class should then up and leave en mass, the Ruling Class would rejoice. I’d agree generally with your perspective – just the one thing I’d add – and its something that I think may be crucial come the crunch – is that while the EU isn’t sure what endgame it really wants, it doesn’t particularly care either. I think this is a key reason why the EU has stayed so united during the Brexit negotiations – Brexit is just not an important issue for most EU countries, so nobody is willing to spend political capital to get their way. This is one reason I doubt there will be any big flare ups or arguments among the EU leaders in Oct/Nov. They just want it over and done with and are generally happy to let Macron and Merkel decide between themselves. Ireland, Belgium and the Netherlands are the only other countries with major ‘skin in the game’ so they are the only ones likely to make any noise. It was nearly two years ago when Hezza (Michael Heseltine) said in an interview on Sky that the greatest danger is that the EU stops caring about Brexit. That point passed long ago and but unfortunately, the notion of they need us more than we need them nonsense will not die and so results in unrealistic demands from the British side. I’m coming more to the view that Col. Smithers mentioned from people close to the EU side that May will capitulate in January. I think we’ve seen in recent weeks that the ERG is split and formed mostly of morons* and people who’ve not understood the status of Britain in the modern world. Rees-Mogg, I’ve come to the conclusion is merely an idiot living in the past and not a disaster capitalist. Redwood on the other hand is a psychopath that wants Britain to join NAFTA if I had to guess his real motive. In the main the ERG is aware of the cataclysm of a crash out and they’ve mostly decided that a deal is better than no deal for now so long as the UK leaves in March next year. *Specifically thinking of Andrea Jenkyns. About the most stupid and thoroughly unsuitable personality to have ever been elected to the Houses of Parliament. If you’re not familiar with her, then think a much more stupid version of Nadine Dorries, and then imagine if such a person had spent the last 30 years sniffing glue. I had to look up Andrea Jenkyns, yes, she does seem like a ‘character’, so to speak. I think there is something to be said for the January capitulation theory, the problem with it is though that I just don’t see how she can get enough votes for one if (as is likely), Corbyn sees it as an opportunity to take down the government and the Ultras and DUP do what they can to stop it. I think far too many people have persuaded themselves that a no deal exit won’t be so bad. If you’re really interested in the stupidity of Andrea Jenkyns MP look at her questioning of Barnier and Sabine Weyand last month in their appearance before the select committee. When I’m overthinking it, I remember reading a piece many years ago that said that the policy of England with regard to internal politics is “to treat the disease with the disease itself”. In this case the disease is Brexit and so the way the establishment (which does not believe in leaving the EU at all) is going to treat it is by delivering it and do so by agreeing a withdrawal period. However, my guess is that the withdrawal period would itself lead to a quite severe downturn and once the job losses hit a tipping point, somebody will propose reversing Brexit and we may well find the country back in by the start of the next budgetary period. The shock is likely to be quite big but delivered over a long time in those years will be manageable. While it won’t be a case of going back to things as they were but the establishment would then be able to take the country back in to the EU, having delivered the will of the people, and I would expect that this would be a manifesto commitment of the Labour Party at least in the next election and possibly even the Tories. Of course, it could just be much simpler and mad people are in charge and they’ve been promoted far beyond their abilities of having a cup of tea and having a meeting about organising yet another meeting about something where decisions are deferred until next month. The claim that the EU has brought prosperity and peace to Europe is frequently made by its adherents. While I support aspects of the EU – in particular the free movement of people – I don’t think there is any evidence to support this claim. The EU and the Euro have brought increased poverty and instability to the countries Brussels bureaucrats call the PIGS – Portugal, Italy, Greece and Spain. All four countries would be better off with their own currencies, determining their own fiscal policies. And as for peace? At what point since the conclusion of WW2 has it seemed likely that France and Germany or Germany and Britain were apt to go to war? The United States runs NATO and would not permit any such thing. At the same time, the US and NATO have managed to destroy one European country – Yugoslavia – and seem hell-bent on getting us into a shooting war with Russia. The EU has made Germany richer, certainly. And it hasn’t harmed the economies of Britain or France. But that benefit has not been shared with the poorer EU members. And the conflation of NATO and the EU (with its desire for a “European” army) makes a major war in Europe a real possibility again. EUR is a relatively recent creation in terms of EU – and Italy, Portugal etc. all queued to get in, in more than one case cheating. People tend to forget that Portugal, Spain and Greece were military (or pretty close to) dictatorships in lifetime of many people reading this (1974/75). Italy wasn’t but one could argue that it didn’t have a functional government since the war, and a large chunk of post-war time was spent battling organised crime on level unheard of in other EU states. Your point on Yugoslavia alone shows a complete ignorance of European history. Well….yes. That’s the point. It hasn’t seemed likely at all, and the increased political and economic integration of them and others can be held up as one of the principle causes. I would guess that 1945 – 2018 is the longest period in history that none of Britain, France, Germany, Netherlands, Spain, Italy and Portugal have been at war with each other. If you were to posit that closer economic and diplomatic relationships among them over the same time-frame have nothing to do with that, I would strongly disagree. Wow. Reminds me of “the crisis was a derivatives crisis, and not a housing crisis“. Sure looks to me like London leveraging its second empire as a threat to the investment class. I’m guessing the powers-that-be in-the-know are putting their time into figuring out who to short more than to increase primary productivity. My view-from-afar has Brexit as like the impetus for electing not-status-quo in the US, a deep understanding that extra-national finance has corroded the working class within the nation while prosperity thrives for the few. We know what Obama did and how that worked out. So the European elite has been put in a position that, in order to maintain access to existing secrecy jurisdictions, they have to prevent the collapse of the British ‘economy,’ but that undercuts the Euro which is a core power plant for them. Noice. To what degree does/can the working class tell’em all to stuff it, demand a no-bailout hard crash, and then MMT up internal productivity? Hmm. MMT is likely to be used as an excuse to give money to the monied interests (“we can’t let Company XYZ fail, it’ll be chaos” vs “we can’t give money to the poors, they’ll forget how to work!” vs “we can’t just make up jobs, they have to come from the private sector, or they’re BAD jobs”), but they will – quelle surprise – balk at using it for the purpose of the common (plebs) good. This is why I am skeptical towards the “MMT as silver bullet” – while understanding MMT can help reduce the illusions people have about the govrnmental budget being equal to household budgets, MMT on its own can be used to motivate the use of your own currency for any number of purposes, good, bad and indifferent. MMT”s problem is that it’s not wrong, but the people pushing it are maybe not up to the real fight. Stupid analogy (can’t help myself): Everybody says a dog is man’s best friend, and I agree, but it’s not that hard to breed a nasty 120lb child killer. MMT proponents need to understand this – their real problem isn’t “acceptance”, but that the wrong people already accept it: The US almost literally uses MMT when it comes to “defense” boondoggle spending. No almost about it: when it comes to the US military “but where will we get the money” never, ever comes up. When Congress gave the Pentagon 61 billion more for its budget than it asked for this year, there wasn’t even an attempt at pretense. Congress decreed the money would be budgeted, and so it was; created as needed out of nothing. MMT is constrained by inflation. Inflation in the current environment tends to be driven mostly by external factors (coz a lot of stuff is imported). I.e. exchange rate. The UK is not an autarky, and cannot realisticly be. That means it has to trade – import (there is no realistic way to replace imports on any sensible timescales. We’re not in 19th century anymore, not that economists realise ). To pay for your imports, you need to either export, or the external parties must be willing to take your currency, or claim some of your hard assets. The more of your currency you create, the more of it will the external parties want unless they believe that they can convert it into the same amounts of hard assets. Which would be unlikely in the UK, as the amount of hard assets is limited, and cumulative growth in their value (price*volume) is limited too (for one, it relies on imports.. ). So, if you lose, extremely optimistically 10% of your total exports (EU exports are say 40% of all exports, so a quarter of that. I believe it’s going to be more like 50% of that or more, but we’re optimists here), it will have a massive impact on your currency. In a no-deal scenario, expect GBP to tank 10% at least, likely more (how much more depends on whether the BoE is more willing to have a currency crisis or credit crisis). Expect that depreciation to have little impact on the UK competitiveness, despite what the Brexiters say (evidence from the 10% post-Brexit vote depreciation shows no real impact on the economy past maybe first 6 months. Here they would at the same time face non-tariff barriers.). So any maneuverability by MMT would be very limited, as the inflation is likely high even if no MMT policies were taken, and higher yet if they were. Hence why Yves says, and I concur, that a war-like economy change planning would be necessary, and it would _still_ require massive quality-of-life sacrifices by probably about 95% of the population (i.e. those not already rich or able to move out), and take a decade+. Absolutely right. The UK problem is not an excessively tight fiscal stance imposed by the EU. It adopted austerity for political reasons to benefit the Tories. It might adopt a more expansionary fiscal policy now but that would be largely opportunistic and unlikely to address the real problems which really have very little to do with EU membership. The real problems are a deeply mendacious right wing English press, excessive inequality which needs an aggressively redistributive tax policy, a workforce with the wrong levels and skill types, a serious lack of housing in the right places and a failure to invest in infrastructure. None of these needs Brexit to be addressed and in many respects will only become more difficult if the economy is weakened by leaving the Single Market. I think it’s more the political class having the wrong levels and skills that have brought us to this sorry pass. MMT is constrained by Sovereignty. It’s not applicable is the country’s external debt is not denominated by its own sovereign currency. MMT currently applies only to the US, and trade surplus nations. All others are subjects of the Predator Capitalism (Neoliberal) system of governance. Sovereignty? Phuleasse.. Show specific reasons how the EU restricted the UK in its fiscal policy with examples. And for your information, the UK has no foreign currency government debt, and happens to have a sovereign currency (and most certainly will keep that post Brexit). You certainly can have your cake, and eat it too! Bulimics do it all the time. I’m also curious about the assumption that a crash out Brexit’s effects will be confined to the UK and EU. Given the complexity of supply chains and financial markets that seems unrealistic. I am having a good laugh at your introductory paragraph although the situation is anything but funny. Thanks a lot for keeping us current on brexit and congrats because it must be quite difficult not to loose one’s mind in this mess. A Corbyn left to the head. Britain given up for dead. Prediction: Corbyn will make hardly any difference were he to form a government and would leave a goodly amount of his supporters disappointed. Perhaps it’s just my cynicism that all politicians are lying scumbags. If I had to guess, the one thing he will likely change is more “ordinary” people becoming MP’s but I don’t think any radical leftist agenda will be instituted or even attempted. My working model is to envisage the UK cabinet as a bunch of headless chickens galloping around the farm yard spraying arterial blood everywhere. While Farage relaxes with a pint and a smoke admiring his handiwork. In my opinion, NC has been consistently correct about the economic/technical intelligence and comprehension of the British government throughout the Brexit runup. Which is to say, near zero. On the other hand, I think you’ve seriously overestimated the resolve and emotional/social intelligence of the EU leadership, and its negotiating team. For whatever reason, they can’t comprehend just how harebrained Westminster is. Again conversely, I think the Brits have–on some level–taken the measure of the EU. And they’re playing a big game of chicken, threatening to disrupt European and world commerce to get some of what they want. I don’t believe the Euro technocrats were ready for that. The situation is somewhat analogous to Hitler’s outrageous behavior in the runup to WWII. The rest of sensible Europe was unprepared for the mayhem he was perfectly happy to create and had planned for. The analogy’s weakness is that Great Britain has no Grossegenralstab backing its ‘on-the-fly’ sort-of-strategy. As demented as Hitler was, he had a better idea of the trouble he was about to cause than May and her Flying Circus do today. The situation is unlikely to end well. I’m not so entirely sure, as I believe that for example the transition period offered by the EU was offered because it helps the EU more than the UK (the UK won’t be able to do much in the 18 months, while the EU is already putting things in). Even “Canada plus” would not be agreed in that timeframe, so the EU is counting on hard, crash-out Brexit. But you may be right not all states actually know what it means (I saw just yesterday a “research” piece on Brexit from a central european bank, and it was a joke). The problem is the “Irish question”, where there is no good solution. Well, there may be one – a reunification referendum in NI and Ireland. Which technically the UK has to grant if asked for by NI (Good Friday Agreement covers that), and it may not be (based on latest polls I saw) that far. Even the mechanism for that is a half-arsed bit of nonsense. A border poll needs to be called if the current Secretary of State for Northern Ireland (currently the utterly dim Karen Bradley) believes that it is likely to vote in favour of reunification. So nobody asking for it or voting for it, just somebody who is on record as saying she doesn’t understand Northern Irish politics waving her finger in the air and guessing which way the wind is blowing. I believe it would be pretty hard for her (or whoever the secretary is at the time) not to call it if there was a consistent string of polls supporting it, and a few pettitions to do so signed by sufficient numbers. I can see how not calling it in that case would pretty much lead back to the good ole Troubles.. The border poll is a mine waiting in the undergrowth for NI politics. Even Sinn Fein have been very cautious about it – they know a premature one would probably fail and that would set them back many years. From SF’s perspective, there are two things on their side – demography (growing catholic/nationalist population), and a long term lowering of the distrust of the Republic by the urban middle classes in Northern Ireland. There will probably be a catholic/nationalist majority in around 10 years. But a vote would still need to persuade a lot of people ‘in the middle’ that the disruption of a United Ireland is worth it. So from their perspective, its still a few years away – their strategy is a chipping away at the ‘differences’ between north and south and, post Brexit, an awareness by the comfortable middle that they’d be better off with Dublin/Brussels than London. So they will do their best not to push too hard and early for one. If the DUP were smart, they’d have gone for a quick border poll on the basis that if the won it, it would justify their Brexit stance. The might still win it now, but I suspect that it would be narrow. As I wrote the last time, historically, united Ireland polled about 20% in NI. Brexit has moved that number massively higher – it was over 40% in pretty much all polls for the last year or so, and growing. I’d be willing to put a bet that post hard, crash-out Brexit, NI would poll to unite. In fact, for the uniters, that may be the best time, as then as the time goes by, people become more used to the situation, so a decade down the track it’s an entirely different beast. BTW, wouldn’t it be fun if SF came into the parliament for the Brexit vote, to help to vote it down? (and then promptly left). It would be pretty spectacular. But given they have to swear an oath of allegiance to the Queen in order to take their seats, I think there’s a greater chance of them grabbing drums and whistles and joining their local Orange Order parade.